A captivating and engaging account of lessons learnt during their year in industry was delivered by our returning final year students to our stage two students at the annual networking event held at Kent Business School. The objective of the event was to bring together those students who have successfully completed their year in industry and are now completing their studies, with those students who are just beginning the process of securing a placement. During the evening, Dr Sue Hornibrook, Head of Placements at Canterbury, explained the key benefits of spending a year in industry to students just beginning the placement process, in particular improving degree performance, enhancing employability, exploring final career choices and experiencing the real world of work. She also further explained the partnership between Kent Business School with the Institute of Directors, and the supporting role of the Placement Team. Our returning students were extremely enthusiastic and positive regarding their experiences during their year in industry, offering advice and encouragement to the audience. They confidently answered questions, and explained their role and placement, how they have developed new skills, matured as individuals, built networks and enhanced their employability as a result of their experiences. Be prepared for hard work (one student wrote up to 50 applications!) but don’t give up. Be creative and flexible in finding placement opportunities – knocking on doors does work! For further information visit the Year in Industry scheme on our website. 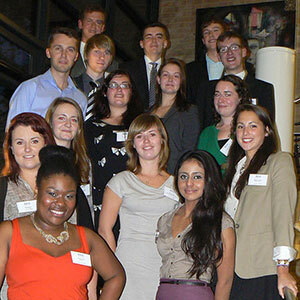 For a gallery of images from this event visit the Kent Business School Facebook page and view the photo album.